Without Gerhard von Scharnhorst, it is unlikely there would be a Carl von Clausewitz. An officer with extraordinary talents and intellect, and an even more remarkable fate, Scharnhorst forever changed the path of the Prussian Army, molded the idea of the Prusso-German General Staff, and forged some of the most influential concepts in the realm of military theory and practice. Yet, he is primarily known as a teacher and mentor to the West’s most influential strategic thinker, Carl von Clausewitz...especially among those less versed in German language and history. While his position as a mentor to Clausewitz is of no small significance, Scharnhorst deserves recognition for his ideas, and they should be studied in their own right. Almost nothing of his extensive literary estate is translated into English, however. The only book-length study of Scharnhorst’s legacy in English, Charles Edward White’s The Enlightened Soldier: Scharnhorst and the Militärische Gesellschaft in Berlin, 1801-1805, offers sizable extracts out of his writings. But this is far from a comprehensive representation of an intellect that played such a crucial role in the modern philosophy of war. With this series, The Strategy Bridge strives to fill this gap. Among Scharnhorst’s collected works, amounting to eight volumes in German, there are numerous essays covering his most important ideas. We will offer the first English translations of some of these texts. As Scharnhorst’s life and legacy remain less known than Clausewitz’s, the following passages also offer a brief introduction. At the end, you will find the essay “On Experience and Theory” written in 1804. Nothing in Scharnhorst’s early life suggested that he would become a great military reformer and a Prussian war hero. He was, in fact, born in the Electorate of Brunswick-Lüneburg (better known by its most important city Hanover), and not Prussia, on November 12, 1775. His hometown Bordenau is just fifteen miles outside of Hanover. The Scharnhorst family was not noble; they were free peasants, and his father served as a non-commissioned officer in the Hanoverian Army. Family inheritance and improvement in social status allowed Scharnhorst’s parents to dream big for their son, though. After receiving only fragmentary education, the teenage boy was provided with a tutor and prepared to enter the military academy of Count Wilhelm in the neighboring principality of Schaumburg-Lippe. With a clear aspiration of becoming an officer, in 1773, at age 17, Scharnhorst entered the school located in Fortress Wilhlemstein. Count Wilhelm zu Schaumburg-Lippe was himself one of the eighteenth century’s advanced military thinkers and educators. He ruled as an enlightened Prince over his tiny-but-independent principality of some 20,000 people, north of Hanover. In the Seven Years’ War (1757-1763), Count Wilhelm commanded the allied artillery of Prussia, Hanover, England, and Schaumburg-Lippe, and also played a significant role in the French defeat in the Battle of Minden in 1759. For the defense of his tiny country, Count Wilhelm relied mostly on his and his officers’ ability to resist foreign invasion and seizure of the state’s fortresses. The curriculum at the military academy, as Bruce Gudmundsson writes in his article on Scharnhorst’s education, thus centered on defense and siegecraft. And it might have been less innovative than previously assumed: “Count William gave his cadets a great deal of practice in solving well-defined problems in a creative, systematic, and methodical way but few, if any, tasks that fostered their ability to act quickly and decisively in novel, ambiguous circumstances.” Beyond his ideas, Count William’s personality had, perhaps, the greatest influence over Scharnhorst. The veteran commander often acted as an instructor to his officers; he inspired them, befriended them, and showed them kindness. It would be this generous behavior Scharnhorst would replicate later when interacting with students and subordinates. In d’Estorff’s view, the ability of a leader to succeed in the ‘small war’ was dependent on their ability to make, in a very short period of time, an accurate estimate of the tactical possibilities of a particular piece of ground, a faculty that he, like so many of his contemporaries, called by the French coup d’oeil (or strike of the eye). The best method for developing coup d’oeil, he argued, combined the critical reading of military history, both ancient and modern, with what he called ‘supposing’ (supponieren), the habit of placing imaginary forces in what-ever real piece of ground happened to be at hand. Trained in yet another novel approach, Scharnhorst was gaining a reputation as a pioneering military educator. In 1783, when a new artillery school was established in Hanover, Scharnhorst was appointed an instructor there. While furthering his own education, "learning by teaching" is Michael Schoy's phrase, he gained a reputation as a pioneering military educator. He also began publishing journals, first Militair Bibliothek (1782-1784), then Bibliothek für Officiere (1785), and finally the most famous, Neues Militärisches Journal (1797-1805), aiming at those interested in broadening their understanding of the military profession. Scharnhorst harbored a deep conviction that education and knowledge could empower officers and help them navigate a complex field. In 1792, he published Militärisches Taschenbuch, zum Gebrauch im Felde, a tactical field guide that would influence several generations of German-speaking officers. When the French Revolution shook Europe in 1789 and the subsequent First Revolutionary War (1792-1795) thrust the continent into twenty-three years of bloodshed, Scharnhorst had the fame of a great expert. No one knew how well he would perform in a real war, however. Finally promoted to Artillery Captain at age thirty-six—a circumstance largely due to his non-aristocratic origins—Scharnhorst proved his mettle against French Revolutionary forces in the defense of Menen in present-day Belgium. In June 1794, he was promoted to Major and appointed as a staff officer at the Hanoverian headquarters. Just like Clausewitz later, Scharnhorst wished more than anything to assume command. His humble origins, however, made this impossible in the Hanoverian Army. As a famed officer enjoying offers from other German states, Scharnhorst began negotiations with Prussia for a transfer. In 1800, he accepted Friedrich Wilhelm III’s offer of elevation to the rank of Lieutenant-Colonel and ennoblement. The next spring, Scharnhorst moved to Berlin. Scharnhorst’s speech was actually clumsy…A long-winded, vague, and halting speaker was the first impression…Elegant society, not excepting some able and intelligent men, considered him a dry scholar and pedant; the army took him for an indecisive, impractical, unmilitary scribbler. Friedrich Wilhelm also failed to embrace Scharnhorst’s bold ideas for military reform. Prussia was still in the midst of its decade of neutrality, when after the Peace of Basel in 1795 it observed from a safer distance the continuing Revolutionary Wars and the rise of Napoleon Bonaparte. Scharnhorst was appointed to helm the Institute in the Military Science for Young Infantry and Cavalry Officers in Berlin, perhaps better known as the Kriegsakademie. Simultaneously, Scharnhorst created the Military Society (Militärische Gesellschaft), where many of the ideas and personalities would emerge that later transformed the Prussian Army and ultimately led it to its victory over Napoleon. He was close to despair, and probably would have given up on the hard endeavor, if it wasn’t [for] Scharnhorst, who encouraged him with his unique kindness and benevolence and at the same time through his enlightened teaching woke up and developed all the seeds of his mental resources. In the first decade of Napoleon’s rise, the question about the origins of French lethality preoccupied military writers. Distilling seemingly timeless principles of war and claiming that they constituted the secret of the Corsican’s astounding victories, Dietrich Heinrich von Bülow, Mathieu Dumas, and Antoine-Henri Jomini became best-selling authors. According to Clausewitz, Scharnhorst was one of the first to realize that most of the key technological and tactical changes were present before the French Revolution; it was the political upheaval that multiplied their destructive capacities. The political overhaul also unleashed the energy and ambition of commanders able to apply these advancements to their fullest potential, none more so than Napoleon. Yet, before the disaster of 1806 shook Prussia out of its lull, few men of authority were eager to listen to and implement Scharnhorst’s reforms. Napoleon’s glorious victory in the Battle of Jena-Auerstedt shattered the old Frederician state. Forced to take refuge in the furthest corner of his state, the city of Köningberg in East Prussia, Friedrich Wilhelm finally embraced a far-reaching reform agenda. The most famous act of the turbulent era, the Oktoberedikt from 1807, aimed at overhauling the ineffective and backward Prussian agrarian system and releasing the economic and patriotic energies of its subjects. It consisted of three measures—abandoning all restrictions on the purchase of nobles’ land to liberalize land ownership and agriculture; opening all occupations to persons of all classes, in effect ending the closed guilds and thus creating a competitive labor market; and abolishing hereditary servitude in the form of serfdom. The subjects had to become citizens of the state and this new political reality, eager to defend that state. Appointed as the head of the Military Reorganization Commission, Scharnhorst now rushed to capitalize on the momentum the political overhaul had created. In 1808, the commission announced sweeping measures, including: appointments based on meritocracy and a phasing-out of the nobility’s privileged access over the officer corps; a new emphasis on education and training; and abandonment of the most severe corporal punishments. Blamed for the disaster at Jena-Auerstedt Prussia’s aging military brass was pushed out of the service in a swift and shocking move. In the 1807 Peace of Tilsit, Napoleon reduced Prussia’s territory and population by more than half and limited the size of its army to 42,000 men from originally 200,000 troops. Scharnhorst’s solution to dodge the restriction was every few months to send on leave veteran soldiers while their companies mustered and educated a batch of new recruits (the so-caller Krümpersystem). Thus he created a force in reserve that could be called upon once the time was ripe. To fulfill his reform agenda, Scharnhorst surrounded himself with a group of talented officers, some of them his former students. In addition to Clausewitz, the group also included August Neidhardt von Gneisenau, Hermann von Boyen, Karl von Grolman, Karl von Tiedemann, and Prince August. The reformers turned their attention to what Trevor N. Dupuy calls a system of “institutionalized military excellence.” Napoleon was surrounded by capable aides-de-camp, trained in his own school of war, expert in various branches of service able to carry out independent assignments. His principal staff officer, Louis Alexandre Berthier, was an experienced and hard-working subordinate able to translate the emperor’s wishes into stellar orders. Yet Napoleon’s general staff remained an organization built around his personal needs, without continuity and authority of its own. On the contrary, the Prussian military reformers worked to institutionalize the general staff and establish it as a dynamic and assertive entity. Scharnhorst believed that carefully selected and superbly prepared staff officers, especially when the Prussian Army lacked a leader to rival Napoleon’s operational genius and charisma, could provide invaluable advice to their commanders, keep them from committing grave mistakes, and enhance the conduct of armies on the battlefield. Later, in the 1813-1814 Campaign, Scharnhorst, Gneisenau, Boyen, Grolman, and Clausewitz would be deployed as chiefs of staff for various armies and corps and prove the system’s viability. Another feature of the Prussian General System was that the chief of staff served not as a mere translator and executor of his commander’s wishes—as was the case for Napoleon and Berthier—but as his closest partner and adviser. The destruction of the Grande Armée in Russia in 1812 finally provided Prussian reformers with an opportunity to create the long-sought people’s army. In early 1813, with Napoleon’s return to Central Europe and the Tsar’s troops in hot pursuit, Prussia faced a perilous choice. It either had to openly switch sides, fight France with everything it had and utterly defeat Napoleon, or face national disintegration. Friedrich Wilhelm agonized for weeks but decided to throw all the nation’s weight and energy behind the anti-Napoleonic coalition. When the king finally switched sides in the spring of 1813, Scharnhorst swiftly unfolded the plans for mass mobilization prepared by his circle. In just three months, from a population of less than five million, Prussia had a force of approximately 130,000 troops ready for deployment, and by fall boasted some 270,000. Even in this moment of professional triumph, Scharnhorst had to swallow a bitter pill. Friedrich Wilhelm did not appoint him as the commander of the main Prussian Army fighting Napoleon in Silesia. The honor went to the famed hussar commander Gebhard Leberecht von Blücher; Scharnhorst, as his chief of staff, still served with distinction. The newly built anti-Napoleonic coalition was far from strong or successful in all of its actions, but its spirit had changed. Napoleon expected that a series of fast defeats and costly battles would knock either Russia or Prussia out of the war, but they did not falter. Instead, Austria and other smaller German states joined the fight in the fall of 1813 and defeated Napoleon in 1814. Scharnhorst, however, did not live to see the fruits of his efforts. He received a wound in the foot in the Battle of Grossgörschen on May 2, 1813, not serious enough to stop him from traveling on a diplomatic mission. However, infection subsequently developed, and, on June 28 in Prague, he unexpectedly died. An educated officer, in Scharnhorst’s view, was an empowered officer. On the contrary, a badly prepared one—especially a badly prepared staff officer—was an insecure actor relying on his limited experience alone. Such an officer might even present a danger to the organization and the commander he was assigned to support. The economical but dense writing was typical for Scharnhorst. Unlike his more famous student Clausewitz, he preferred composing short essays and often sought to publish them quickly as a way to engage in ongoing debates. “A Discussion of the Main Reasons for the French Successes in the Revolutionary Wars and Especially in the Campaign of 1794,” perhaps his most famous and consequential treatise from 1797, is merely forty pages long, for example. Clausewitz provides a clear description of his mentor’s approach: “Diffuseness was therefore never in evidence in his written work, for he kept correcting and revising his text until his exceptionally precise mind was entirely satisfied and not one word seemed out of place.” Neither did Scharnhorst make use of the vivid metaphors for which his student became famous. Scharnhorst was, first and foremost, a military educator seeking to instruct and inspire the average officer who might never rise to the profession’s top or grow to become a shrewd strategic thinker, but still strived to give his best. This quest for raising the bar might not produce a once-in-a-lifetime military genius with predictable regularity, but Scharnhorst believed it would inevitably lead to a qualitative change and institutionalize excellence. When the officer in the General Staff has received a good education in times of peace, in times of war he will quickly become useful in many roles. But without a good education in times of peace, an officer in the General Staff will never achieve anything significant in war. For the latter requires judgement, which is developed through repeated study of military incidents, and a great amount of past facts that we have to keep in mind. These are necessary if we wish, in all cases that occur, thanks to resemblance in circumstances, to be able to judge to some degree the success of an enterprise and avoid the mistakes experience could discover––if we wish to consult all the special circumstances and among the numerous possibilities to choose the most beneficial ones. Nothing in this case is more dangerous than one’s own experience without the understanding with which military history provides us. The few instances of this personal experience now become the yardstick, and all similar occurrences are judged according to them, even if the circumstances and the results are marked by a greater diversity. I have often seen how deficient, in terms of providing advice, those perform who apply only the facts they have personally experienced. How uncertain and fearful they are in undertaking something the circumstances require, but they have never encountered in the span of their life. These people do not know what one should dare in war. Through reminiscences of a hundred possible but unlikely disasters, they make the general they support anxious. They would, perhaps, never dare an audacious thought because no similar case from history, crowned with success, gives them the necessary confidence. Charles Edward White. 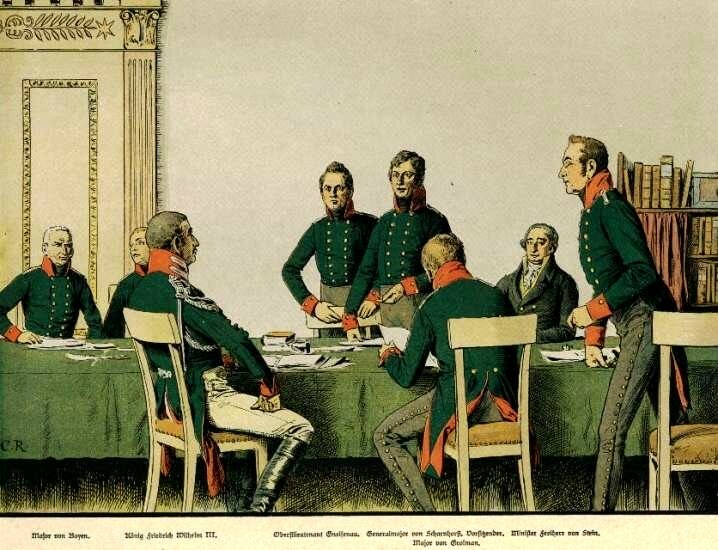 The Enlightened Soldier: Scharnhorst and the Militarische Gesellschaft in Berlin, 1801-1805. Westport, CT: Praeger Publishers, 1989. Carl von Clausewitz. “On the Life and Character of Scharnhorst.” Historical and Political Writings, ed. and trans. by Peter Paret and Daniel Moran. Princeton: Princeton University Press, 199), 85-108. Bruce Gudmundsson. “The Education of the Enlightened Soldier.” MCU Journal Vol. 9, No. 1 (2018): 33-44. Michael Schoy. “General Gerhard von Scharnhorst: Mentor of Clausewitz and Father of the Prussian-German General Staff.” Canadian Defense Forces Publication. Trevor N. Dupuy. A Genius For War: The German Army And General Staff, 1807–1945. Englewood Cliffs, N.J.: Prentice-Hall, 1977. Vanya Eftimova Bellinger is the author of Marie von Clausewitz: The Woman Behind the Making of On War. She currently teaches at Air University’s Graduate School of Professional Military Education and Air Command and Staff College and is working on her second book, a study of Carl von Clausewitz’s Last Campaign (1830-1831). The views expressed are her own and do not reflect the official position of the U.S. Air Force, the Department of Defense, or the U.S. Government. Vanya Eftimova Bellinger and The Strategy Bridge would like to thank Air University’s Muir S.Fairchild Research Information Center for its support for this project. Charles Edward White, The Enlightened Soldier: Scharnhorst and the Militarische Gesellschaft in Berlin, 1801-1805 (Westport, CT: Praeger Publishers, 1989). Gerhard von Scharnhorst, Private und dienstliche Schriften, ed. by Johannes Kunisch, Michael Sikora, etc., Vol. 1-8 (Vienna: Boelau Verlag, 2002-2014). Next to White’s The Enlightened Soldier: Scharnhorst and the Militarische Gesellschaft in Berlin, 1801-1805, in English you can read more on Scharnhorst’s life in Michael Schoy, “General Gerhard von Scharnhorst: Mentor of Clausewitz and Father of the Prussian-German General Staff,” Canadian Defense Forces Publication. In his biography of Clausewitz, Peter Paret offers a summary of Scharnhorst’s life and ideas: Peter Paret, Clausewitz and the State:The Man, His Theories, and His Times (Princeton: Princeton University Press, 1985 ), 56-77. You can find a more recent study of Clausewitz and his relationship with Scharnhorst in Donald Stoker’s biography of Clausewitz too, Donald Stoker, Clausewitz: His Life and Work (New York: Oxford University Press, 2014), 28-32, 73-77 and 151-165. Bruce Gudmundsson, “The Education of the Enlightened Soldier,” MCU Journal Vol. 9, No. 1 (2018): 38. Michael Schoy, “General Gerhard von Scharnhorst,” 4. Schoy, “General Gerhard von Scharnhorst,” 6. Carl von Clausewitz, “On the Life and Character of Scharnhorst.” in Historical and Political Writings, ed. and trans. by Peter Paret and Daniel Moran (Princeton: Princeton University Press, 1992), 101. Anonymous (Marie von Clausewitz), “Erinnerung an den General Clausewitz und sein Verhältnis zu Scharnhorst,” Historisch-Politische Zeitschrift, Vol. 1 (1832): 214. Carl von Clausewitz, On War, edited and translated by Michael Howard and Peter Paret (Princeton: Princeton University Press, 1989), 141. Krümper was the Prussian Army’s term for retired or former soldier. Later on, the veteran soldiers were sent permanently home as reserves and called for annual training only, while the younger ones assumed regular service. In English John T. Kuehn offers a concise discussion of Scharnhorst’s reforms, see John T. Kuehn, Napoleonic Warfare: The Operational Art of the Great Campaigns (Santa Barbara, CA: Praeger, 2015), 174-176. More information about the two lesser known members of the reform circle: Tiedemann was Clausewitz’s best friend in the Kriegsakademie and also left Prussian service in 1812 to fight against Napoleon in Russia. He was tragically killed by Prussian soldiers in battle. More on Tiedemann, see Paret, Clausewitz and the State, 186-188 and 225, and Vanya Eftimova Bellinger, Marie von Clausewitz: The Woman Behind the Making of ON WAR (New York: Oxford University Press USA, 2015), 127-128. Prince August was a first cousin of the king, a classmate of Clausewitz, and his superior officer between 1804-1808. In 1808, Prince August became the head of the Prussian artillery and together with Scharnhorst worked on reorganizing and modernizing the branch. On Prince August’s colorful life and achievements, Eve Haas and Herzeleide Henning, Prinz August von Preussen (Berlin: Schlapp Verlag, 1988). Trevor N. Dupuy, A Genius For War: The German Army And General Staff, 1807–1945 (Englewood Cliffs, N.J.: Prentice-Hall, 1977), 24. Reinhard Höhn, Scharnhorsts Vermächtnis (Frankfurt am Main: Bernard&Graefe Verlag, 1972), 312-313. Henry Kissinger, A World Restored: Metternich, Castlereagh, and the Problems of Peace, 1812-1822 (Boston: Houghton Mifflin Company, 1973), 49. Paret, Clausewitz and the State, 235. Original title “Entwickelung der allgemeinen Ursachen des Glücks der Franzosen in dem Revolutionskriege, und insbesondere in den Feldzügen von 1794.” You can find its modern German version for instance in Gerhard von Scharnhorst, Ausgewählte Schriften, edited by Ursula von Gersdorff Osnabrück: Biblio Verlag, 1983), 47-110. Titled “Bruchstück über Erfahrung und Theorie. 1804” it was first found in the archives and published in Rudolf Stadelmann, Scharnhorst: Schicksal und Geistige Welt (Wiesbaden: Limes Verlag, 1952), 155-156. The text could be also found in Scharnhorst, Ausgewählte Schriften, 147-150.